Stolen blood, stolen coin and stolen lives, the childer of Caine know all three. Beyond the courts of princes and voivodes, vampires earn their bloody way in the city streets and bandit warrens. They stake out their own informal principalities among the growing cities and lawless woods. Murder, larceny and trickery are their tools often used against the very elders who consider them beneath notice. 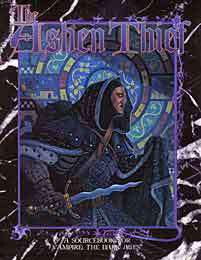 The Ashen Thief is a complete guide for players and Storytellers of the unliving tricksters, bandits and thieves of Vampire: The Dark Ages. It covers vampiric involvement in the banditry and growing panoply of crimes in medieval cities. It also covers the sects that use crime and larceny as a cover for their struggle against the princes of the Long Night: the subtle Prometheans and the violent Furores.